Today I am having tea while I work in my room. It's a bit messy, but that is inevitable! Lol. I try to begin my morning with drawing. And a cup of warm tea to get comfy with. Today is full of sun. Which is a lovely change. about the drawings I shared. You have no idea how much your kind words help me keep trying. My tea cup today is a lovely violet cup I found in England a few years back. The tea cup is a sweetie with beautiful hand painted violets. I have shared this beautiful thistle teapot before, it is made by Wade. I just love it too. The swirl design along with the scalloped gold edge give this cup an elegant and romantic feel. It was manufactured by Embassy Ware in Fondeville England. Here is the intro to the children's Beatrix Potter DVD series. My children and I have loved these stories since I first saw them. My kids are all grown up now, but the recent rains here reminded me of it. About 2 and a half minutes in she makes herself tea. It is very quaint and comfy. The blue transferware cup and the silver tea strainer are beautiful. 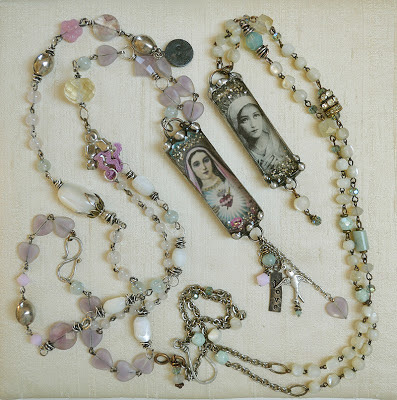 Creative Workshops is hosting a new jewelry class of mine. I will be mentioning it on and off as we get closer to the opening. I will give away a free class to a lucky winner! I chose a Mother Mary Image as for these two pieces. The other one came from a card in a very old Bible I found. Thank you for coming over to visit! I so enjoyed seeing your many gorgeous tea cups and tea settings last week! If you would like to join in just go and post with your tea cup. Martha and I love to come over and visit you! Keep Martha and her family in your hearts, good thoughts and prayers if you can. Thanks for sharing as always..
You are so talented drawing and making such beautiful jewelery. Your studio is grand - your little tea setting perfect - and that B Pottery vid adorable~ will definaley have to look up that series. vous avez un bon "coup de crayon "
tout à porter de mains , l'idéal ! I am LOVING your studio!! What a pretty little tea table! I love your thistle pot and the cup set is beautiful. 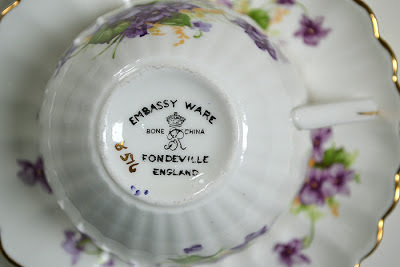 I'm headed to England this fall and am hoping to pick up a pretty tea cup and saucer. Homemaking Linkup going on now! It's always nice to see where another does their crafting. Your teacup with the violets is pretty. 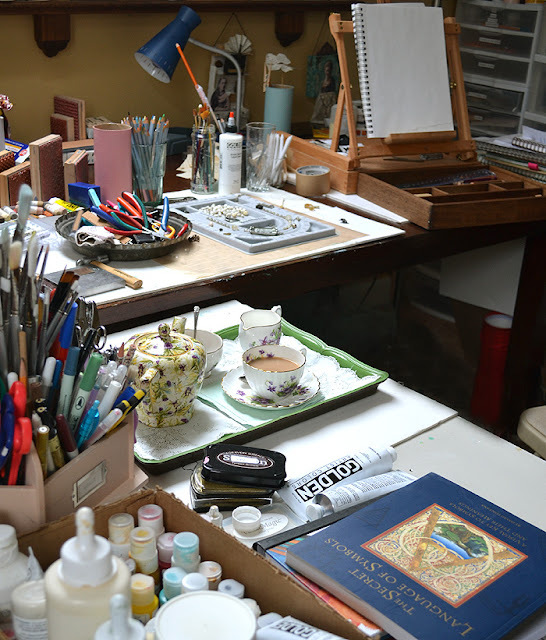 Loved the peek inside your studio where all your creativity comes into being, Terri! Your tea tray is lovely! I thoroughly enjoyed the Beatrix Potter YouTube video. I just might have to get that DVD series! Beatrix's tea tray was lovely too! I love your teacup sprinkled with violets. It really is a sweetie. I so enjoyed the video; charming. Love Beatrix Potter too. Thank you for sharing and have a lovely day. It's so nice to see your teacup post today, and you in your artroom, all cozy, it warms my soul. Here it is dark and gray today, again, and snow is looming. You always share the most delightful china. That teapot with thistles is so unique! And thanks for letting us peep into your art den, the place of all beautiful and inspired creations!!! Have a great week, dear Terri. It's lovely to see another artist's studio. I usually take huge mugs of tea into mine...lol. Funny, I wanted to photograph my violet cups for this post as well. Violets are such perfect spring flowers, aren't they? I sometimes candy the blossoms for cake decorations, especially for my youngest child, who's birthday is in April. Such a cosy and wonderful room, to have tea in, while being creative or inspired from all the materials around. The teapot is such a happy pattern and colours, and the cup is adorable, dear Terri. Everything is so beautiful: your tea set, your jewelry and your studio. I need to scroll back to find your artwork now. Thanks for hosting us, and may you have a very blessed day. Terri, so nice to visit you in your studio. I love your jewelry and your drawings. Your violet teacup is wonderful. A great way to start the day -- tea and art! Happy Tea Day and Thank you for hosting. What a wonderful art room! How fab! No excuses for not creating treasures! LOL! Love the teacup and teapot...so pretty! This is another delicious teacup and I also love the teapot. They go so well together. What a gorgeous teaset. The teapot is lovely with the teacup. And it's so "you" to have tea in your studio. I'm going to check the vid: I love Beatrix Potter! Hi Terri, Your teacup and teapot are just beautiful! Love your art studio, and your art work too. Have a great week! Yay tea in the art room is fabulous..the perfect place to create and enjoy the spirit of tea! how cool..we have the same book.."secret-l-o-s"..how magical is that ha ha! Beautiful photos..love your table top easel..they are so handy! Gorgeous tea post..and beautiful cups..love the violets..totally blissful! And I love the new course you shared..looks wonderful! HUgs..shine on in all that you do and create! Hello Terri. I love your studio. What a great space to be creative. And you tea setting is just perfect. Is is the perfect setting to get inspired. Love the video of Beatrix Potter and all the cute little animals. Peter rabbit is a favorite that my kids use to read. Love your pretty violet teacup and teapot. Your studio and tea vignette looks like the perfect place for relaxing and being creative. Thanks for sharing. The jewelry is gorgeous! Your studio is fabulous. It really is a true artist's creative space. I could just jump through the screen to play with all those fabulous supplies. And the cup is darling. It makes the tea look delicious. 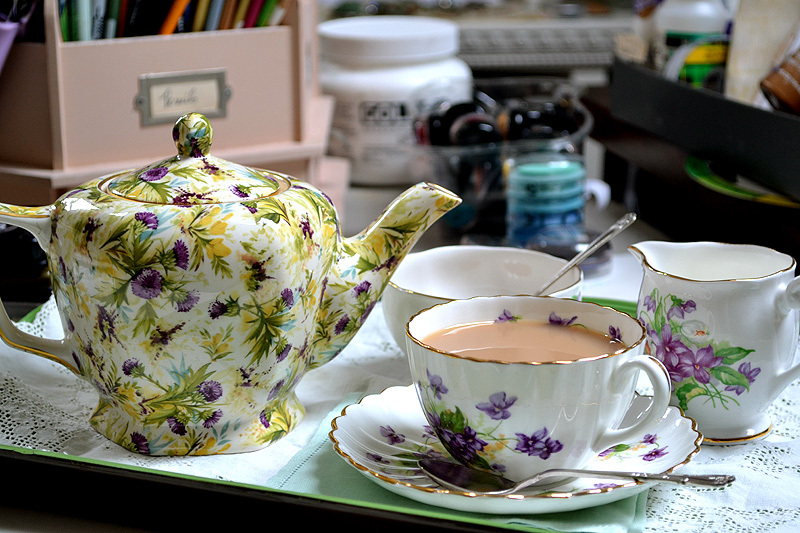 Taking tea in your Art room must be delightful, it looks beautiful. My Mother had a cup with violets and it was always one of my favourites. I love Beatrix Potter books and have some which I love. I have that video and watch it many times myself. It is a beautiful movie and also calming. Especially nice to watch with grandchildren as you snuggle together on the sofa and drink peppermint tea. Your workshop looks so full of creative possibilities and your blog shows your endless and beautiful creativity. The teacup and teapot look right at home there. 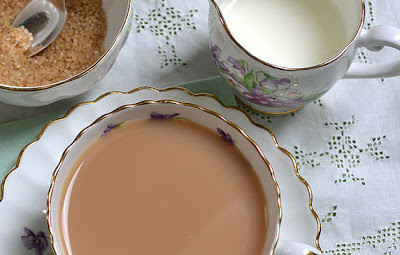 Thank-you for hosting this Tea Cup Tuesday blog party Terri, it has enriched my life. so nice to see your creative atelier. Its not messy at all! And what a sweet tea tray you have made. The tea cup is so springy. Good inspiration for romantic jewelry. Thank you so much for sharing all this creative inspirations and for hosting this sweet event. It's nice to be able to peep into your workshop. It's very artistic and functional. Love the tea cup as well. I did not know that Beatrix has a different version made into film. It was so special to see a glimpse of your studio at work. Thanks for hosting. Gracias nuevamente por venir a mi Argentina a visitarme. Me siento muy honrada. Tu taza de violetas es preciosa, elegante, fina. Tus joyas son muy creativas, tú eres talentosa. merci de ta visite sur mon blog! et de ton gentil commentaire! désolée je parle très mal anglais! It was a treat to get a peek inside your art studio. What a wonderful place to find inspiration. Especially with a pot of tea and a hot cuppa in that beautiful china. Dreamy! I just treated myself to the Miss Potter movie the other night! luv all the tea scene settings ..
and your lovely violets :)) EnJoy! Hi Terri....oh how delightful it is to peek into your creative space...with all of your yummy art supplies strewn about. I wanted to crawl inside the photo and come draw with you....and have tea too, of course. I'm off to catch up on your past posts...I'm thinking I've missed a few...must see these drawings you mentioned. I received Martha's sweet tea pot yesterday and I'll be posting about it hopefully next Tuesday to join up with all of you darling ladies! What a lovely post and gorgeous teacups and jewelry. A feast for the eyes! Hope all is well your way sweetie? Maybe spring has sprung there? We are still waiting in Michigan but I cannot complain. It was a mild winter in my opinion! Loved that intro to Beatrix Potter. I didn't know they had it on DVD. Will have to buy that for the grands. Your violet teacup is pretty. I have one similar to yours - packed up for moving. Congrats on your new creative classes. Hi Terri, I really am taken with the lovely teapot in your photo. I just love Beatrice Potter. I feel like I had tea with you in your studio....so fun. Thanks for giving us a little look. Your studio looks great, Terri. The teapot with thistles is amazing. hi terri your jewelry is beautiful. I love this teacup and the pot. The cup reminds me of spring and is so sweet. I am a coffee drinker, but do drink tea as well. Every week I keep thinking I am just going to make a cup of tea and join you! I love your studio it's fabulous! Congrats in your new classes and the teacups and violets are lovely. You are such an artist and very talented too! Thank you for hosting and have a happy St. Patty's week to you. You have so many wonderful things in your art room! 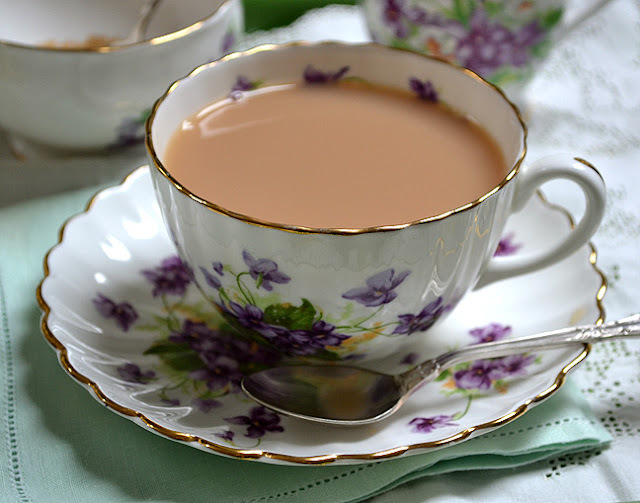 Your teacup is such a delight with those delicate violets. Thank you for sharing it all with us. What an exciting post Terri....your new class looks excellent!